Over Ghyll Self-cateringThis comfortable first floor apartment created in part of the former bobbin mill at The Falls will be a good location for your Lakeland holiday. With the centre of Ambleside within walking distance you will find plenty of eating places and good shopping easily to hand. Over Ghyll, as its name implies, is situated overlooking the Stock Ghyll River which tumbles down the valley into the village and there are pleasant outlooks from all the main windows. There are walks from the door for all ages and abilities and you could happily stay here without much need to use your car. Accommodation: Private entrance at first floor level from shared internal staircase. Entrance hall with cupboard for coats etc.. Pleasant sitting/dining room with windows on two sides catches the morning sun (flat screen TV with freesat HD, DVD, CD/tape/radio and free Wi-fi) and has a relaxing holiday feel. The separate kitchen, which is of a contemporary style and includes worktops of local green slate, overlooks the trees and river. There are two bedrooms - one double and one twin - and a modern fitted bathroom with bath with shower over, basin and wc. 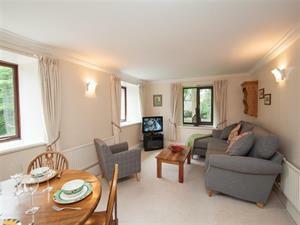 The property is cosy throughout the year. Furnishings are comfortable with fitted carpets throughout. Outside: Private parking for one car. Walks from the door to Ambleside centre for shopping, eating out etc.. The more active will enjoy the challenge of The Fairfield Horseshoe, Loughrigg and Wansfell and the property is well placed for touring to all parts of the Lake District. Sorry no pets * non-smoking * duvets/beds made up for arrival * gas central heating and hot water * all fuel included * electric cooker and separate hob * dishwasher * microwave * auto washer and dryer * fridge * freezer * free Wi-fi * Ambleside centre approximately half mile downhill * travel cot and high chair available - please order * towels available - please order. This comfortable first floor apartment created in part of the former bobbin mill at The Falls will be a good location for your Lakeland holiday. Over Ghyll offers weekly bookings starting on Saturday.